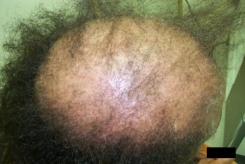 Cicatricial alopecia is one of the most destructive hair loss conditions that exists. It's defined as a hair loss condition that causes damage to hair follicles so that strands of hair are replaced by strands of scar tissue. There are several medical conditions that can be involved in this disease process. The images below illustrate the various way an individual's scalp can be effected. You can be affected by a variety of medical conditions that can cause injury and destruction of hair follicles. Some of these conditions may be associated with symptoms such as itching or irritation or soreness, but with others you can lose hair and develop scarring without knowing that it is going on. Sometimes you will have a bald spot or area of hair loss detected by your hair stylist without your knowing that it was there. This condition has become more common over the past 10-15 years especially related to more frequent practices of using hair extensions and bonding glues on the scalp. 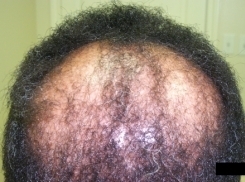 There are three main contributing factors to this type of balding. 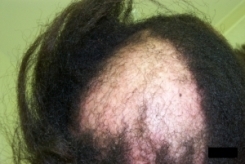 Trauma, infection and various skin diseases may injure the hair follicle resulting in localized areas of scarring and bald patches in which there are no visible follicles. 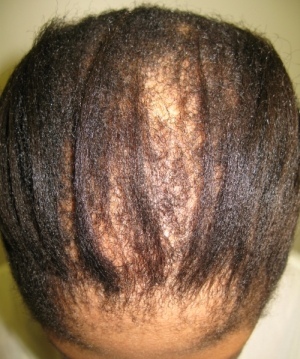 Trauma: Hair can be pulled out by tight curlers or certain hair styles, especially black women’s hair styles, sometimes resulting in permanently thinned areas (traction alopecia). The scalp can also be injured by heat (hair dryers), or chemicals (perming solutions or bleach or glues or dyes). Skin diseases that may it include: central centrifigual scarring alopecia (CCSA), folliculitis decalvans , lichen planopilaris , frontal fibrosing alopecia , alopecia mucinosa , discoid lupus erythematosus , sarcoidosis, cicatricial pemphigoid, alopecia neoplastica, and scleroderma . 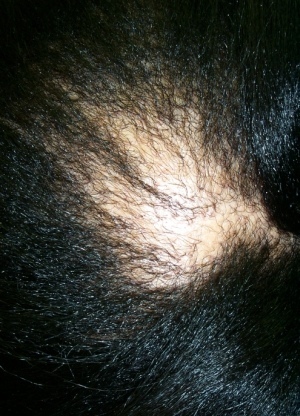 Scarring hair loss of unknown cause is known as pseudopelade. (www.CARFintl.com) is an organization that has been created to help support research and find a cure for this problematic condition. Visit their website for additional information. Scarring is just beginning and hair growth is beginning to get thinner. A definite bald spot with scar tissue is present which can lead to placing a hair attachment to hide the baldness. 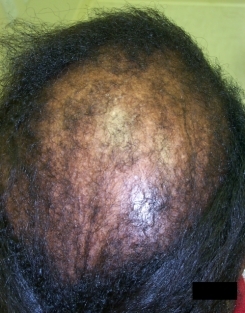 Progressive baldness and loss of hair has taken place with severe permanent hair loss. One of the goals of BlackHairMedicalExpert.com is to detect, diagnose, and treat hair loss early to prevent permanent baldness.